William “Barry” Inman, BA-BS, CIC, has 31 years of experience as an epidemiologist. He works for the Brevard County Health Department in Merritt Island, Florida. He is responsible for the development and implementation of surveillance and investigation of all communicable diseases. Additionally, he is a faculty member for Brevard Community College and the University of Central Florida teaching classes on infection control. Barry has completed advanced training in bio-terrorism through the Department of Health in Florida, Center for Disease Control and Prevention, and the United States Army Institute of Research for Infectious Diseases. Barry has also received training in various communicable diseases and disease outbreak investigations. Because of his extensive experience and education, he has assisted the CDC and Quarantine Service with the investigation of outbreaks on cruise ships for legionella, rubella, measles, norovirus and MRSA. He has done communicable disease investigations in long-term care facilities, hospitals, cruise ships, nursing homes and day-care facilities. Barry has developed infection control programs for hospitals, long-term care facilities, rehab centers, health departments and others. After Hurricane Katrina, he was part of the CDC team that developed an epidemiology/surveillance program for disaster response. Barry has won numerous awards over the years, including the National Association of County and Community Health Organizations (NACCHO) award for Cruise Ship Investigation and Mitigation of measles, varicella, and rubella. He also won a NACCHO award for “Super Hands”, a hand washing video developed for the control of communicable diseases. 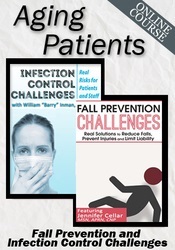 Barry also writes a quarterly article for the AMA Journal on various infectious diseases. Financial: William B. Inman has an employment relationship with Brevard County Health Department. He receives a speaking honorarium from PESI, Inc.
Nonfinancial: William B. Inman has no relevant nonfinancial relationship to disclose.